Welcome guests to your home with this custom mosaic sign, made from hand cut and glazed tiles. 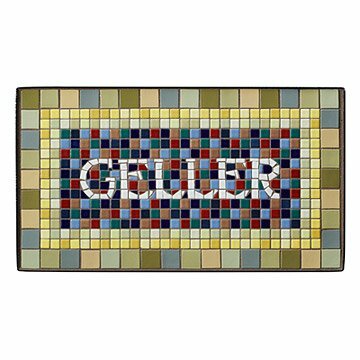 A colorful array of handcrafted and hand glazed tiles come together in classic mosaic form in this personalized house sign. Inspired by New York's iconic Lexington Avenue/59th Street MTA station, the sign can be customized to display your family name, house number, or even a unique "station" of your choosing. The busiest rapid transit line in the United States, the IRT Lexington line opened on July 17, 1918 and remains the only line in Manhattan to directly serve the Upper East Side and East Midtown. This beautifully made design serves as a charming nod to history as well as a warm welcome to your own little metropolis. The hanging mechanism is mounted on the back of the sign for easy installation. Designs officially licensed by the MTA. Handmade in Fort Pierce, Florida. Click to see the 59th and Lex and Times Square Printed House Signs.